The Butterflyfishes of the family Chaetodontidae are iconic marine aquarium fishes. Being medium to large, laterally compressed fish, often with highly ornate patterning, they are a beautiful addition to any aquarium. They are a fairly diverse group of fish with 12 genera representing 129 species. The Copperband Butterfly is one of the most identifiable members of this family and can be found in almost any fish store on any given day. Butterflyfishes are found throughout the Atlantic, Indian and Pacific oceans. Butterflyfish exhibit a range of dietary preferences, with most species consuming strictly coral polyps and anemones. Butterflyfish are pelagic spawners, sometimes occurring in schools or pairs, meaning they rise into the water column and release their gametes into the water to be swept away by the ocean currents. One of the most fascinating aspects of butterflyfish biology is the period during their juvenile development in which they are covered in large bony plates that disappear as they mature! Butterflyfish are gorgeous fish with ornate patterns that make them highly desirable for marine aquariums. Unfortunately, due to their dietary restrictions, many species do not make good candidates for aquariums. In the wild, many species of butterflyfish consume exclusively coral polyps. This diet is nearly impossible to reproduce in captivity, and of course makes them poor candidates for a tank with living coral. 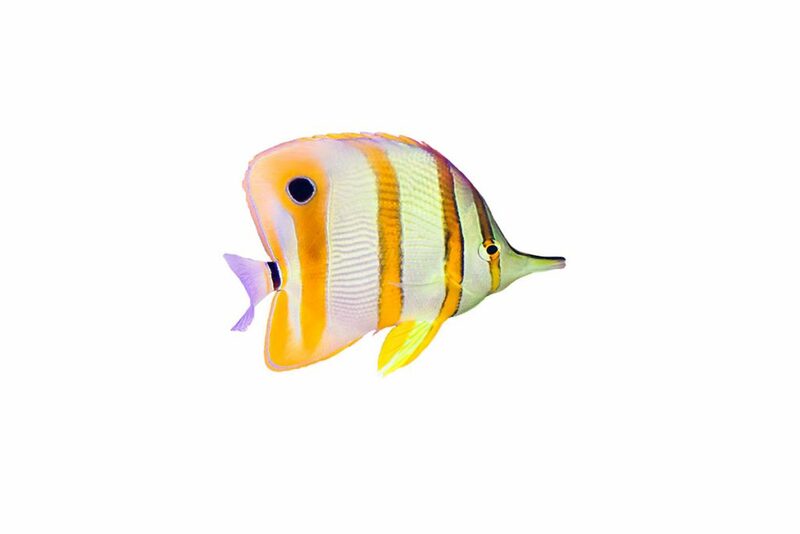 Fortunately, there are many beautiful species of butterflyfish that have a more generalized diet consisting largely of zooplankton, which makes them great candidates for the marine aquarium. Most species of butterflyfish are active swimmers that can reach moderate sizes of 6 to 12”, so a tank of 125 gallons or larger is suggested for most species. We suggest a diet based on Piscine Energetics Frozen Mysis, Piscine Energetics Frozen Calanus, Piscine Energetics Pellets (1mm and 2mm) and Piscine Energetics Saltwater Flakes.